Two years ago I detailed my preferred method of making cowboy coffee in the field, and advocated for it as the all around best method. Plenty of articles about backcountry coffee have come out since, but there is still no new news here. Via is convenient (especially as it is quite palatable cold), but expensive and for all Starbucks work still has an aftertaste suitable for taking paint off car hoods. The Aeropress and various french press accessories work well, but for me will always be unacceptably bulky for true backcountry (save something like a canoe trip). There is also, in my mind, a lot to be said for applying technique to create something beautiful, rather than buying yet another gadget. The main difficulty with cowboy coffee is cleanup. If you’re not camping near a water source it’s difficult to not have a big mess to sort out later. Given my serious coffee habit, and the serious performance-enhancing benefits of caffeine, I never skimp on coffee, and that often means bringing both Via and fine grounds. The former is for quick mornings and mid-day breaks, the later for sit-down breakfasts and extended stops mid-day. 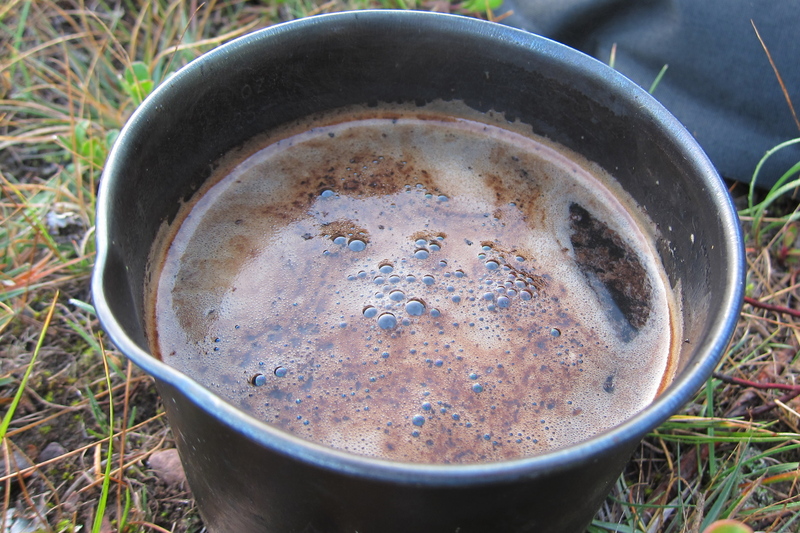 Regardless, don’t faff about with backcountry coffee. Bring plenty, and do it right. Below the photo is my original text on making cowboy coffee, updated. Bring to a roiling boil, and keep it there for 10-15 seconds. On most camp stoves doing this without boiling over will require a less than full pot, as well as hovering the pot over the burner using a grip, pliers, or a glove/sock. Consensus seems to be that coffee ought to be brought to 200F (+/- 5F) for best results. Given that 200F is the boiling point at around 6000 feet, and the 5 degree margin of error encompasses the boiling point between 4000 and 9000 feet, we hikers appear to be in good shape. The length at which coffee should be held at said temp comes down to personal preference. I have a strong affinity for bitterness, so I go longer. If a triple espresso is not your normal mid-afternoon snack, as it is mine, you might want to boil only briefly or not at all. Drink. You can decant from the pot into mugs/cups/bottles, or drink straight from the pot. Obviously, don’t swirl or otherwise seriously disturb the coffee, or attempt to pour or drink the last ounce at the bottom. Be sure to use biodegradable filters if you are in the backcountry. Instead of the paper filter I have bought this ultralight filter (goo.gl/HBnTZK, 3g) which is a product from old GDR. Cowboy coffee is a bit unforgiving, but with modest practice you won’t be drinking grounds. I’ve never found a pour-over method that gave me what I was looking for; too flat. That’s true. Pour-over is not the method for a coffee à la italiana. I always add the grounds right off a boil, rather than at the beginning to cold water. Upside of this is there’s no danger of a mess from coffee boiling over but the downside is waiting longer post boil til the beans have sunk. I also find hitting a boil seems to really amp the bitterness compared to adding the beans just off a boil, but this could be my imagination. With a thin light pot in cold weather, my coffee can be colder than I like when I start to drink. Combine that with a single wall mug and you need to stay focused to get the coffee in before it’s cold. I’ve tried all the tricks to get beans to sink and found no good substitute for time. I stir every 2 minutes for about 5 minutes and then wait a couple and drink. The only faster method I’ve found is pouring the coffee between containers and discarding the bottom 10% each time. I pour it into mugs, dump the grinds, pour it back into the pot and maybe repeat 2x more. Saves a minute or two but usually more hassle than it’s worth. I’m fairly impatient when I’m ready for coffee so I’ve found holding the lid mostly on while pouring keeps almost all grounds out except for a few at the very beginning of the pour and you don’t have to worry about sinking. A little bourbon residue left in the cup from night before is also quite nice.